International Space Station Crew - Solar System Planets And Moons Section. International Space Station Crew Begins Unloading Progress. An unmanned Progress cargo ship reached the International Space Station on Sunday, and the two-man crew got right to work unloading its cargo. Cosmonaut Salizhan Sharipov and NASA Astronaut Leroy Chiao had both cut their food consumption by 10% to stretch out supplies, and had each lost a few kg during the last month. The Progress ship is carrying 2.5 tonnes of supplies, including a 15kg (33 pound) gift package for each man. An unpiloted Russian cargo ship linked up the International Space Station this evening, completing a two-day Christmas journey to deliver 2.5 tons of food, fuel, oxygen, water, supplies and holiday gifts to the crew. The ISS Progress 16 craft automatically docked to the aft port of the Zvezda Service Module at 5:58 p.m. CST (2358 GMT) as the spaceship and the International Space Station flew 225 statute miles over Central Asia. Within minutes, hooks and latches between the two ships engaged, forming a tight seal between the two vehicles. 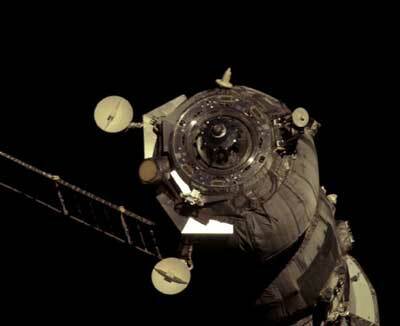 The docking occurred about 30 minutes later than planned so that the linkup could occur over Russian ground stations with the benefit of television from the cargo ship and real-time data. As the Progress moved in for its linkup, Expedition 10 Flight Engineer Salizhan Sharipov was at the controls of a manual docking system in Zvezda, ready to take over the Progress’ final approach in the unlikely event its automated docking system encountered a problem. But the docking was flawless. International Space Station Commander and NASA Science Officer Leroy Chiao was nearby, taking video and still photos of the Progress arrival. Launched from the Baikonur Cosmodrome in Kazakhstan on Thursday, the Progress is loaded with 1,234 pounds of propellant, 110 pounds of oxygen and air to help maintain the International Space Station’s atmosphere, 926 pounds of water and more than 2,700 pounds of spare parts, life support system components and experiment hardware. The manifest also includes 69 containers of food, about a 112-day supply. After an extended sleep period this evening, the crew will be awakened Sunday morning to conduct leak checks at the hatch interface between the Progress and Zvezda. They will open the Progress hatch shortly after noon CST (1800 GMT) Sunday to begin unloading its cargo. Among the new items that arrived at the International Space Station are laptop computers, new spares for U.S. spacesuits and components for the arrival next year of the European Automated Transfer Vehicle cargo craft.